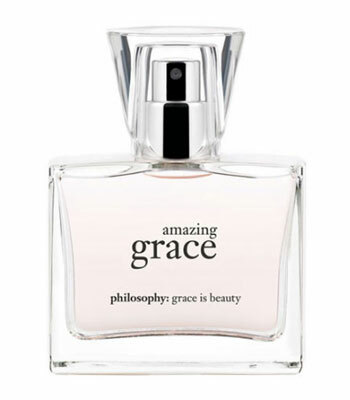 Amazing Grace Eau de Toilette is a shared / unisex perfume by Philosophy. There are 21 reviews of Amazing Grace Eau de Toilette. Philosophy is a perfume and cosmetics company founded by Christina Carlino in 1996, infusing technology and advancements in chemistry to deliver products that appear deceptively simple and elegant, but are really rather complex yet still affordable. The brand mostly centers around a feminine audience but does serve up the random masculine or unisex product here and there, plus factors in Carlino's Christian beliefs and ideals to the brand's aesthetic. All this compounds into a love-or-hate reaction because the idea of Christian cosmetics alone sounds like something of an oxymoron since vanity is usually eschewed by the faith, but most people never dig that far into the branding of Philosophy anyway, and their products are rather nice for what they try to be. Amazing Grace (1996) is the launch scent from the company, was originally pitched to women (but is now used by men and folks of all genders), and has spawned tons of flankers in the time since release. You're getting a rather uncomplicated citric floral musk here, which is right in line with the clean, apologetic thinking that was so profuse in 90's fragrance, but the scent retains some charm even if not quite becoming a classic decades on. The opening of Amazing Grace is a pretty friendly bergamot sweetened with a bit of orange and grapefruit, giving a shower gel/body spray kind of opening once it mixes with freesia. The development from this very "Bath & Body Works" kind of opening is slight, heading down to muguet, jasmine hedione, and a speck of geraniol that is supposed to be the claimed clean rose accord of the scent. Overall, it's a pretty common but well-done white floral mixture that will surprise nobody, and gender-neutral enough to make a good after-bath spritz, especially when the limonene/linalool/white musk base shows up to take you to the conclusion telegraphed by the opening. Elegant and almost minimalist really, I can see why Amazing Grace won over so many people in the 90's, then continued to do well for the Philosophy label, but the smell is too boring to really wear anywhere outside the bathroom and bedroom, when you are snuggling up with late-night TV before bed. There isn't much romance here, but any partner in your life won't be put off if you wear this either, so I suppose in a casual setting this can do. Wear time is short at about 6 hours, with mild sillage, but this is a 90's female-marketed fragrance made at the height of the decade's "beige age" trend, so with that knowledge in hand, it seems fitting. Whoever penned this composition was either phoning it in, or just intentionally delivering the "bare walls" equivalent of a floral musk. Amazing Grace can be easily sampled as it is sold anywhere Philosophy products can be found, including Ulta, Macy's, and even some drug stores like Walgreens. There's no delusions of grandeur here, just a humble product for your consideration, with a bit of spiritually-inspired wisdom printed in plain text on the box. I've known a few women who have worn Amazing Grace, and it really imparts no personality on them, being really just a slight step to the left from an intentional unisex fragrance like Calvin Klein cK One (1994), which is why it has likely sneaked its way into a few guy's wardrobes too. I don't dislike Amazing Grace, but it is just so extremely plain like a white bed sheet that I really can't recommend it either, so I'm going to give it a neutral. Some people may be looking for something in this vein as an almost aromatherapy-style relaxation method, which might be worth considering if coupled with the accompanying bath assortment. The flankers for Amazing Grace have been a lot more interesting overall, so if you find yourself unenthused about this just as me, don't write off the rest of the Amazing Grace line just yet. In this case, something less isn't more like the famous adage proclaims, but just actually less. I just bought this one for my girlfriend after having smelled it on a friend of mine- all I can say is "Wow"! It's the most amazingly calming scent I've ever encountered; a nice warm soap that is instantly relaxing and a joy to the senses. I smelled this on numerous other women, stopped them in their tracks, and asked them what it was. "Amazing Grace," was the frequent reply. I could tell it was a musk, and a good one at that. The first time I tried it, by myself, was on paper, and the rose stood out for hours. On my skin, however, this perfume rapidly receeded into an exceedingly clean musk that quickly apologized befor slinking off into soapiness. Disappointing. My other favorite musk, one which makes me stop strangers and inquire, is Egyptian Goddess perfume oil by Auric Blends, which is less complex and wears better, without changing, on me. Philosophy AMAZING GRACE is doubly misnamed. Another shower-in-a-bottle frag, this one is so nondescript that the most I can say is that it's a very slightly soapy, very light generic floral composition. Could be peony; could be lily-of-the-valley. In the end, this is the classic “abstract floral” (aka “chemical soup”) about which some self-proclaimed authorities (cough cough) have raved. After two cases, I'm starting to understand the underlying philosophy of the Philosophy brand: it's all about being bland. Bland is not ugly nor is it a source of strife. On the other hand, it's neither beautiful nor inspiring. It's really the epitome of “meh,” a bit like white noise: you just tune it out after a bit of time. These GRACE fragrances call to mind an article I recently read by a woman who took SSRIs for five years and reported that during that time she watched her life from afar, and, while she cared, she did not care so much. She noticed that her memory was worse, but she attributed it to her advancing age (all of 40...). Same story for her somewhat doughy, slightly flabby body. And she just didn't care. So naturally she did not care that she did not care. This is how I feel about the Philosophy line: I just don't care for these compositions at all, though I have nothing in particular against them. They are entirely forgettable “unperfumes” to me. They're not even distinct enough to be anti-perfume, because in order to be anti- something, you have to have something to say. This ia a nice everyday parfume. Doesn't last long on me though. I do like the scent. Appropriate for all ages. Would suggest as a gift. Who needs Prozac when you have Amazing Grace? It's extremely comforting. The perfume defies description - not quite a floral, not spicy, not green, just a clean, comforting scent. I spray it when I need a pick-me-up. Philosophy Amazing Grace edt .05oz Trial Vial NEW! !